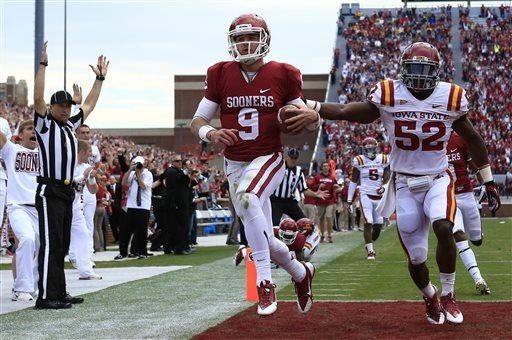 The Sooners looked to have the offense on track in the second half of their 48-10 win over Big 12 foe the Iowa State Cyclones. The defense looked great other than the second quarter of play, where they allowed 10 points. That was all Iowa State was getting on the day. Starting Junior Quarterback Blake Bell left the game in the second quarter after taking a high hit from an ISU line backer on a Quarterback keeper. Redshirt Freshman Trevor Knight took over the offense from then on out, and produced better than he had all season. The Sooner’s have exactly 6 days to prepare for a showdown in Manhattan Kansas with conference opponent Kansas State. The wildcats under coach Bill Snyder have began to see signs of improvement from his team. The Wildcats have now rattled off four straight wins after their close call with TCU at home this weekend. The Sooner’s open up as a four and a half point underdog to KSU on the road. With Trevor Knight playing as good as he did against Iowa State, OU may have a quarterback controversy on their hands. That contributes in large part as to why Vegas opened the line with the Sooners as the underdog for next Saturday. It will be interesting to see how Coach Stoops and the rest of the Sooner coaching staff handle the quarterbacks this week after the fantastic display put on by the back ups.